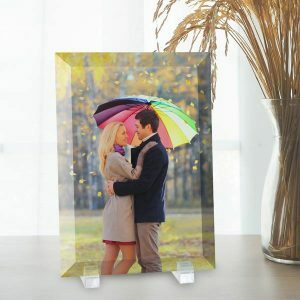 From personalized home décor to office accessories, we offer a wide range of photo gifts that you can design with your favorite digital pictures. Upload any digital picture and transform it into a masterpiece that can be enjoyed year after year. Print Shop has loads of custom options so you can create a unique keepsake for yourself or a fun gift for anyone on your shopping list! Speaking of gifts, you can also print photo cards online to accompany any special keepsake that you have designed yourself! 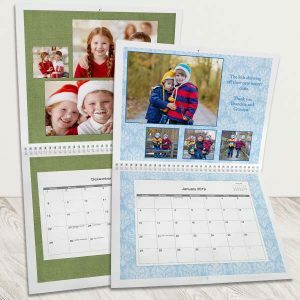 Create two sided photo cards, folding photo cards, or print your own greetings on photo paper! With Mother’s Day around the corner, it’s time to start thinking about personalized gifts for Mom. 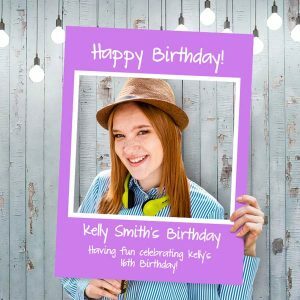 Print Shop allows you to create unique keepsakes and decor accessories using your favorite photos. From personalized kitchen gifts to custom playing cards we have the right gift waiting for you to design yourself for the Mom in your life! Maybe you have a cute family picture saved on your phone. Or, a favorite photo of yourself with Mom on vacation at the beach. No matter the picture, you can upload it Print Shop Lab and turn it into a unique keepsake that’s sure to bring a smile to her face. Pair your gift with a custom photo Mother’s Day card, and you’ll have a Mother’s Day Mom won’t soon forget! Looking for unique gifts for Dad? At Print Shop, we offer dozens of options that you can personalize yourself. To get started, just upload your photos. Then, after choosing your gift, you can select from a variety of template options, drop your photos into place, and even add your own text. Make Dad a set of custom coaster for his office. Or, create a personalized photo T shirt that features a favorite photo from your last camping trip together. We have tons of custom options and products to choose from. In addition, you can also make a custom Father’s Day card to accompany your gift. For one-stop Father’s Day gift shopping, Print Shop will not disappoint! At Print Shop, we offer high quality photo prints which you can display around your home in elegant frames. In addition to professional photo prints, our home décor collection includes other products which showcase your memories in a unique, new way! Our custom desktop plaques are printed on solid pressed wood with a lustrous finish for a contemporary look. Our acrylic photo prints and beveled glass prints look great on your favorite décor shelf as well. If you’re need of something more practical, our photo jewelry box is ideal for brightening up your nightstand and for keeping your valuables safe. Just upload your photos to get started and update your décor with something made from the heart. Maybe your desk at work is looking a little drab or you’ve been searching for a gift to give your favorite coworker. No matter the occasion, our personalized office accessories are a great way of adding a fun touch to the work day. 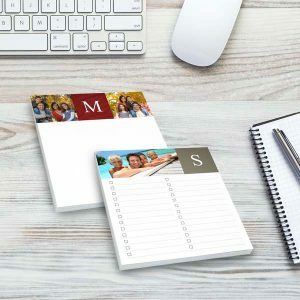 From paperweights and photo notepads to custom mouse pads and customized desk organizers, we have something for everyone. Add text, logos, or even your own artwork to make the perfect office accessory that’s both practical and fun! In addition to the office and living area, we have several products to enhance your dining experience. Create custom photo coasters and personalized placemats to add a little color to your kitchen or dining room table. They’re perfect for wedding photos, snapshots of the kids, pet pictures, and so much more. Speaking of dining, we also have grocery photo bags that let you tote your food home from the market in style! Or, you can create an apron with photos printed on the front to wear a favorite memory while baking or preparing dinner. Like our other personalized kitchen accessories, you can add text, artwork, and more to your customized design for a more personalized look. 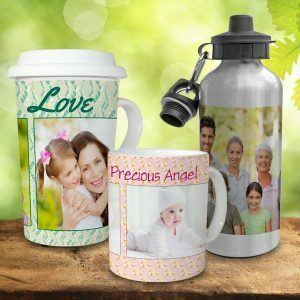 Custom photo mugs are a classic way of showcasing your photos in addition to photo prints and photo canvases. We have multiple background designs to choose from to accompany your favorite photos. You can create your own collage layout full of your best pictures from years past. Enjoy your morning coffee or tea with our classic ceramic photo mug or create the perfect custom travel mug to keep you company on your morning commute. We also offer custom heat activated coffee mugs. Watch your photos appear before your eyes as soon as you pour your morning beverage! Keep up with your child’s height with our personalized growth chart. 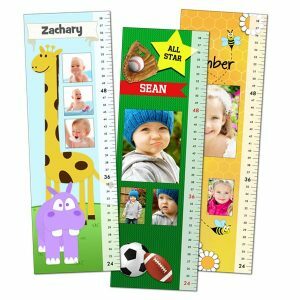 Kids love seeing how much they’ve grown and now you can incorporate a photo and their name into their growth chart design. Our charts have a peel and stick backing to they can be applied to any flat surface in your home. Even better, they don’t leave marks behind since you can remove the chart at any time! We offer several backgrounds to compliment your little one’s interests or hobbies so that it fits their personality. Display it in their bedroom or in your kitchen and make our custom growth chart a part of your daily routine! If you’re looking for unique gifts, then you’ve come to the right place. You can personalize any of our products with your favorite photos for a gift with added meaning. 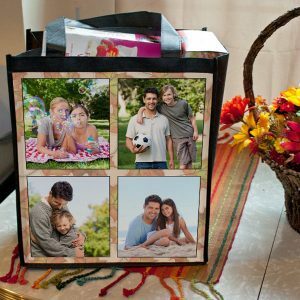 Whether it’s snapshots of the kids or pictures from your summer vacation, you can make amazing gifts either for yourself or a loved one, no matter the occasion. Let the time pass you by on those quiet rainy days with our personalized photo puzzles. Upload a photo and create a jigsaw puzzle that depicts a favorite memory. Watching your favorite memory come to life, piece-by-piece, is perfect for entertaining the entire family. 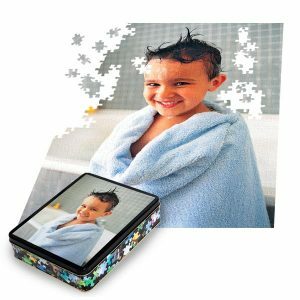 Our custom puzzle also includes a storage tin that’s printed with your photo as well. Keep one for your game collection at home or order one as a thoughtful gift for anyone on your shopping list. Speaking of games, we also have custom playing cards! 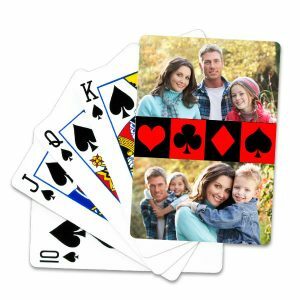 Choose from multiple layouts so you can have your favorite photos custom printed on a card deck of your own! Our personalized accessories also make great gifts that are practical too! Perfect for birthdays or Father’s Day, our personalized ties can be custom printed with a single photo. Just upload your photo and your image will be custom printed as a collage on your necktie layout over a black background. You can use photos, logos, or even your own designs to make a necktie that compliments your wardrobe. Keychains are also a classic accessory that you can use each day! Our silver photo keychain and leather photo keychain are great for keeping your memories close no matter where you go. Upload your child’s school photo or a favorite family snapshot and create a useful accessory that’s full of personality. From home décor and kitchen accessories, to custom photo toys and games, we have a wide selection of personalized gifts to choose from. Better yet, you can incorporate your favorite photographic moments into your design and use our custom options to compliment your style. Add photos, text, or even your own artwork along with our designer inspired background patterns to make a photo gift that’s uniquely “you”. Whether you want to brighten your home with a little character or create a keepsake for a loved one, our photo gift collection is guaranteed to fit the bill!